Preheat oven to 350°F. In a medium bowl, whisk together all-purpose flour, baking powder and salt. In a stand mixer with a paddle attachment or with a hand mixer, cream together the butter and sugar until light and fluffy, about 5-6 minutes. Stir in dry ingredient mixture in three batches. Once combined, add cream and vanilla extract and mix until the dough is just combined. Try not to over mix. At this point you can chill the dough until needed or immediately roll it out on a lightly floured surface (the dough will be easier to work with if it's chilled). Roll out the dough until it's 1/8 inch thick and cut 3 inch rounds out of the dough. Use a donut hole puncher to punch out the center of each cookie. Transfer cookies to a baking sheet lined with parchment paper. You should get about three dozen cookies. Bake cookies at 350°F for 10-12 minutes until they are just starting to crack and lightly browned around the edges. Remove and let cool. Scoop coconut into a baking dish and bake at 350°F until it's lightly browned, about 12-15 minutes, stirring every five minutes. Watch it closely, as it can quickly burn. Add caramels to a metal bowl and place the bowl over a small pot of boiling water. Add the milk and a pinch of salt to the bowl and let the caramels melt, stirring occasionally. Once the caramel mixture is completely smooth and melted, brush each cookie with the caramel. This will help the topping stick. Once cookies are brushed, mix toasted coconut into the rest of the caramel mixture and pack the mixture onto the top of each cookie in a small mound. Melt chocolate over the same boiling water bath. Once melted, dip each cookie into the chocolate so it coats the bottom of the cookie. Then drizzle the tops of the cookies with the remaining chocolate. Chill cookies for an hour or more to harden caramel and chocolate, and serve! Just like your favorite boxed version, but whipped up in your own kitchen. You know these cookies. They're sold in little green boxes by cute little kids. It’s okay to buy a few boxes to support their cause. Encouraged, in fact! But unless you’re an excellent planner, you might have a craving for these cookies when it’s not Girl Scout cookie season. So, here’s how you can make homemade Samoas in your own kitchen. Samoas have a very thin cookie in the middle. It helps support the caramel and coconut and chocolate. We can easily make these little cookies. They end up being slightly crunchier – you might be surprised how much you love the homemade version of these cookies. It’s a simple dough recipe, starting with blending together the butter and sugar in a stand mixer (or with a hand mixer). Then just add in your dry ingredients and finish the dough with some cream and vanilla. You can chill the dough at this point and it will be easy to work with, but if you are quick, you can roll it out immediately and punch out your cookies. You should get about three dozen 3-inch cookies from a batch of dough. You can just use a smaller cookie cutter to punch out the center (or, honestly, you could just leave them in rounds). Transfer the cookies to a baking sheet lined with parchment paper and bake them at 350ºF for 10-12 minutes until they are a bit crispy and lightly browned around the edges. Meanwhile, unwrap your caramels and add them to a metal bowl with some milk and a pinch of salt. Place the bowl over a small pot of simmering water and let them melt completely. Stir the caramel occasionally. It’ll take 5 minutes or so to melt completely. Lightly brush each of the cookies with some of the caramel. This will help the topping stick to the cookies later. Meanwhile, add the shredded coconut (unsweetened is best) to a baking dish and bake for 12-15 minutes until it’s a light, tan color. Stir it occasionally and watch it carefully. Then stir the coconut into the caramel. Using your hands, mound the coconut caramel mixture on top of each cookie. Feel free to pile it high! Then melt your chocolate over the same simmering water and dip each of the cookies into the chocolate to give them that signature look. Once all your cookies are dipped, drizzle the cookies with the rest of the melted chocolate and let them cool completely in the fridge. As they cool the chocolate and caramel will harden slightly, which is nice. 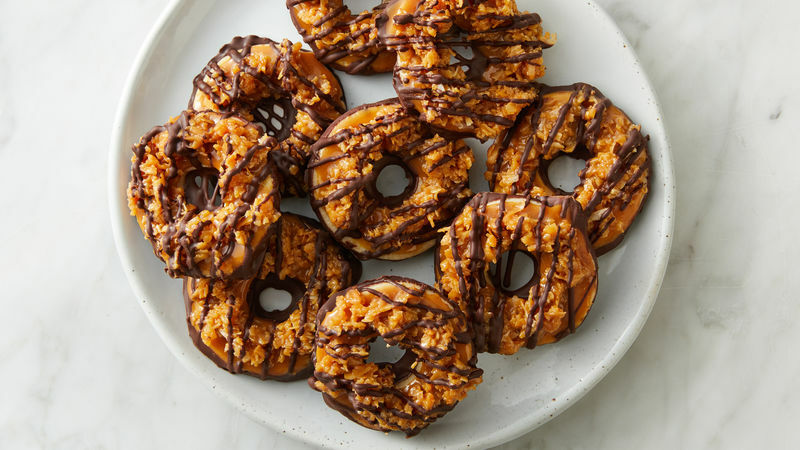 Support the Girl Scouts, but when you're out of those cookies, make these. They are super good! Nick got this recipe originally from a Just a Taste recipe and adapted it slightly. Check out his blog, Macheesmo, and follow him on his Tablespoon Profile.